The price of a single semiconductor wafer the size of two hand palms is extremely costly for the surface is coated with gold. A wafer of 750 micrometer thickness is polished to thinner than one-third through ultra-high-speed back grinding. In this process, even a slight difference in thickness may cause a problem in which electricity does not travel across chips. This is why the role of the back grinding tape holding the wafer is critical in the process of grinding. Since its establishment in 2006, BECS Co., Ltd. has developed a liquid masking coating agent by utilizing the know-how gained through its clearing business in the semiconductor and fl at panel display (FPD) fields in the early stage. The company further transformed itself from a total cleaning solution provider to a fine chemistry company and successfully sett led the masking coating business, a core process of semiconductors, LCDs, and TSPs in the market. BECS has developed a liquid-type coating for wafer back grinding that can replace the existing lamination film type. The wafer back grinding is a process to reduce resistance and improve heat conductivity by removing needless films and grinding the thick reverse side. Consisting of film type and liquid type, it reduces over 70% material costs compared with BG tape. The wafer back grinding can be applied to the process of dicing before grinding (DBG) and stealth dicing before grinding (SDBG). Back grinding is easy for the sawing process and minimizes the package thickness as well as exhales working heat. The liquid coating reduces over 70% material costs compared with BG tape. The process is as simple as four to six steps. If the wheel keeps rotating with die separated, faults may occur due to the collision among chips and mixed dust. 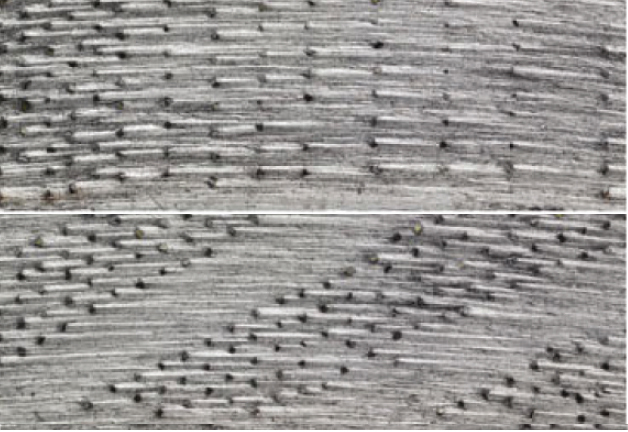 As kerf width is maintained between dies, chips are fixed during back grounding. It is easy to release with no residue. In the process of laser sawing, it forms a protective film on the surface of the wafer to be cut, which protects the wafer from debris and particles generated while dicing. The coating agent is released in the shape of film when it is dipped into water after use. The amount of yielding wafer dicing increases by preventing cracks on the wafer that may be created during the sawing process. It is also easy to release in the shape of film or tape in the water and dries quickly. [INQ. NO. 1504E12] As a leading maker of electronic measuring equipment in Korea, Master, which established in 1986, has been supplying display equipment(LCD, PDP, and TV monitors) and standard image quality inspection equipment for manufacturing to overseas corporations of Samsung Electronics and LG Electronics and some domestic customer companies. Since establishment of affiliate R&D center of the company, it has actively been participated in some flagship projects, largely supported by the Korean government. In the year of 2010, Master started development and production projects of the so-called SI-integrated system equipment such as Matrix, Switchers, Fiber Optic, KVM extenders for the application of broadcasting, telecommunication equipment, monitoring rooms in public offices, telepresence rooms, rail/air control systems, CCTV systems, hospitals, and education facilities. For 2015, Master plan to promote its three key series FXC series, IMR matrix series, and IFDE series-to potential foreign markets with the aim of enjoying specific amount of increased export. FXC series, a fiber converter extender, is designed to transmit a signal by using a light from host up to 2km with the help of the inputted signals of component, video(s-video, CVBS), VGA, three HD-SDI, DVI(HDMI). Also individual design is available based on the selected input and output signals by the specific end-users. Two channels of LC type optic fiber is applied, so it enables fast speed, long distance transmission. 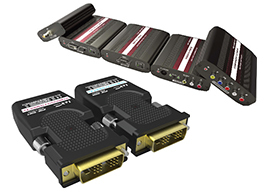 Master’s IMR matrix series is kind of modular matrix router that integrates various video signals and audio signals such as DVI/HDMI/Fiber into a router and it switches and distributes variety of video and audio signals. Designed to be easily operated, it gives operators convenience in operation while also allowing them to save time. The series supports the differentiated remotely controllable functions(TCP/IP, RS-232C). It also supports various resolutions(Max 1920×1200). It enables long distance transmission, supported by fiber card. The maker’s IFDE series is made especially focusing on the part of digital video interface with the aim of delivering clean signals from host to a place far away from it by using optic cables. It is designed with LC type of optic fiber that ensures fast speed, long distance transmission. It is a KC certification of KCC-REM-BLX-MSFG1WBJ12-certified product. Compatible with HDCP 1.2 version, it supports function of DID reader. [INQ. NO. 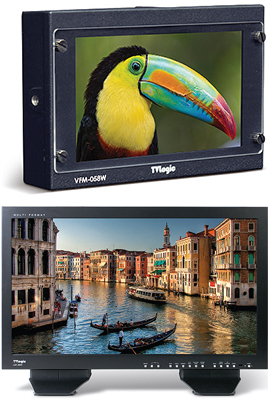 1412E02] TVLogic’s new model VFM-058W is the successor to its popular VFM-056WP viewfinder monitor and is designed for demanding compact monitoring. A 6”x4”x1” lightweight magnesium-alloy case houses a 5.5” native 1920×1080 LED backlit LCD display with a full complement of preferred features, including DSLR Scale, focus assist, HDMI / HD-SDI cross conversion, waveform/vector scope, Y level check, range error check various scan models, markers, audio level metering with speaker, and time code display. TVLogic, designer and manufacturer of LCD and OLED high definition displays, recently presented two new field production monitors, two 24” broadcast models and two 4K displays at NAB 2014 that incorporate a host of innovative features for digital cinema and broadcast production. TVLogic combined the latest in flat-panel technology with their advanced video processing designs to provide reference displays that meet the demanding requirements of broadcast, production, post-production, digital signage and multi-viewer applications. The 10 new models finally joined TVLogic’s multi-award winning range of professional video monitoring solutions. Shinhan Diamond Industrial has produced a variety of diamond tools from products for construction and stone to those for precision industries and for high-tech materials such as silicon wafers for semiconductor and flat panel displays including LCD (Liquid Crystal Display) and PDP (Plasma Display Panel) since its establishment in 1978. For the best diamond array products in the world, ARIX, the original technology of diamond array adapted to serial production since 2005 has applied the new follow-up ARIX Generation with more enhanced metallurgy, more precise control over diamond positions and more esthetical and functional design of diamond segments for each product range. It is almost impossible to find one perfect solution of diamond tools that is the best for every case no matter what customers are in need of. ARIX Technology is able to place diamond grits precisely in three dimensional patterns and to deliver the best performance to customers in all cases. Filed Under: KOTRA Tagged With: ARIX Technology, Diamond Tools, LCD, metallurgy, PDP, Shinhan Diamond Industrial Co. Ltd.
[INQ. NO. 1311C05] Myung Information Technologies Co., Ltd. (www.myung.co.kr) is Korea’s leading data recovery company with its technology and business capacity being verified by its many customers around the world. 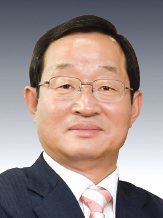 Mr. Lee Myung-jae, founder and CEO of Myung Information Technologies was awarded the 51st Trader of the Month Award for his contribution to developing the company into a globally recognized HDD repairing and data recovery business. With experience in a foreign-affiliated company of HDD head components, Mr. Lee started the HDD repairing business in 1990. With highly trained technicians for data recovery, class 100 clean room, servo writes and other facilities, Myung Information Technologies retains technical leadership and has offered more than 300,000 data recovery services as of 2012. Based on such success in the HDD repairing and data recovery field, Myung Information has expanded its business arena into the repair of LCD panels and manufacturing of SSD. Increasing sales in overseas data recovery market is not easy. However, about 12% of its revenues come from abroad. The company expects that the rate will further increase, given that the business in the U.S. and Chinese branches is getting brisker, and collaborations with Malaysian and Japanese companies are growing. Data recovery means recovering corrupted data on the media destroyed by physical or logical errors. The company’s recovery service includes all media including HDD, FDD, ODD, Tape, Zip, Jaz memory disk, RAID, NAS and SAN. Myung Information has played an important role in raising Korea’s data protection and security technology to global standards. It once again demonstrated its advanced data recovery technology by fully recovering image data immersed in seawater for 45 days from the highprofile ROK Navy ship Cheonan. The company has exported data recovery technology to Japanese and Thai companies, and the Malaysian government. Now this company is exploring new frontiers to make the most of the technology. LCD Repair: When problems come up due to damaged LCD panel or electric circuits, Myung Information Technology can perfectly repair the LCD by utilizing its world-class facility, technology and personnel. With full confidence in quality, it provides reliable service to major LCD makers such as Samsung, LG and Sharp as well as at an international level with countries such as Mexico, Brazil, India, Thailand and Algeria. SSD (Solid State Drive): SSD is designed to record data on flash memory, which allows it to record and read data at higher speed. Myung started to produce SSD as the first company to do so in Korea in 2004 and takes requests to create customized SSD products for companies to meet their individual needs. Now, Myung distributes its SSD not only in the domestic market but also in overseas markets. As a leader in semiconductor, display and solar cell manufacturing technologies in the global market, JUSUNG Engineering is asserting its ever-higher global presence. Itspioneering deposition technology enables flat panel display makers to dramatically enhance high-definition resolution in next-generation displays. The new product utilizes a metal organic chemical vapor deposition (MOCVD) technology to apply the critical transparent semiconductor oxide material for use on flat panels. 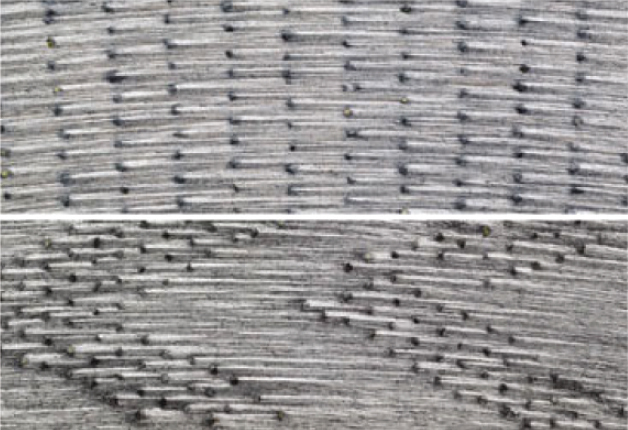 This new material, IGZO – Indium, Gallium, Zinc, Oxygen, replaces the traditional amorphous silicon based active layer. IGZO has an electron mobility 40 times greater than traditional materials such that a display’s reaction speed can be more swiftly controlled. In doing so, panel makers will be able to offer screen resolutions higher than the current Full High Definition. JUSUNG is the only company in the World that offers this MOCVD IGZO capability for 8th-Generation-sized panels. MOCVD offers significant benefits over conventional deposition methods. Specifically, it allows panel makers to fine tune the composition of the IGZO material to customize it for their application. This is a significant step in the application of the new material because previous conventional deposition methods such as sputtering limit the composition to fixed ratios. By improving upon these shortcomings, JUSUNG expects this new MOCVD technology to gain market acceptance as panel makers seek to expand their product offerings. JUSUNG’s new MOCVD IGZO is compatible with next-generation LCD TVs, OLED TVs, and mobile displays. As such, the company will focus on enhancing this technology to secure a greater share of the flat panel deposition market. Since itsestablishment in 1995, JUSUNG Engineering has been a leading provider of manufacturing technologies for the global marketplace. Based in Korea with a network of worldwide offices, it offers innovative and differentiated technologies for the semiconductor, flat panel display, and solar markets. It has also entered the lighting market through leveraging its core technologies and applying them for LED and OLED lighting. JUSUNG’s innovations are currently employed in many of the world’s leading technology manufacturing companies. As such, JUSUNG is securing its position as an industry leader for enabling, next-generation technologies. cassettes, cap assemblies, and transfer belts. Sang-a Frontec’s main product is the LCD cassette, a mechanism for transporting LCD glass during the manufacturing process. LCD cassettes are used to load, store and transport cell glass used for TFT-LCD production. LCD cassettes are manufactured using plastic components made from extruded plastic and parts such as CFRP, AL and SUS. LCD cassettes can be used for a wide variety of applications for the entire FPD industry. Sang-a Frontec exports its products to display panel manufacturers in China and Taiwan, and plans to create an overseas sales office in 2013 to strengthen its export marketing activities. Sang-a Frontec is the world’s largest supplier of LCD cassette systems in the world with a market share of over 90% of the world’s LCD panel manufacturers. This market dominance is further augmented by the recent establishment of a dedicated production line for LCD cassette systems. Sang-a Frontec is the exclusive supplier to leading LCD panel companies including LG Display, BOE and INNOLUX. • Sang-a Frontec Co., Ltd. If you want more information about ‘Sang-a Frontec Co.’, please contact us.